Be the first to share your favorite memory, photo or story of Ruby . This memorial page is dedicated for family, friends and future generations to celebrate the life of their loved one. 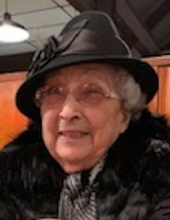 Kinston-Ruby Lee Alphin, 94, conquered her earthly life on Sunday, December 2, 2018. Ruby was born on November 23, 1924, in Lenoir County, to the late Walter Van Lee and Bettie Taylor Lee. In addition to her parents, Ruby was preceded in death by her husband, Bevely L. Alphin, James C. Stein, her son in law, whom she considered to be a son, and a sister, Swannie Lee Williamson. Ms. Ruby was known for her impeccable sense of style and fashion. She was always dressed to the nines. Whether out on the town or raking leaves in the yard, no matter where you saw her she was always well put together. Ruby’s collection of hats may have been her favorite part of her wardrobe. With nearly 200 of them, she could top off any outfit with just the right accessory. Her affinity for shopping kept her closet updated. It didn’t matter to Ruby if she was shopping at the grocery store or the finest boutique, she just loved to shop. “Designs by Sheila” was always a favorite stop for her and she found a true friend in Sheila. Ms. Ruby enjoyed being out and about, and was always happy to see a familiar face. With a wide array of skills and talents, Ruby designed and created many beautiful items for the ones she loved. The pieces that she would crochet and knit were second to none. Ms. Ruby also had a flair for working outdoors and maintained a pristine yard. Even in her 90’s it was not uncommon to see her outside with the leaf blower or a chainsaw, making sure things were up to her standards. Of all the hobbies Ms. Ruby enjoyed, though, nothing was better to her than showing off pictures of her grandkids. She could always be found with a photo album nearby and was quick to share the photos of her grandchildren and granddogs. There is no simple way to describe Ms. Ruby because she was a one-of-a-kind lady. She was unique, beautiful, and thoughtful. Ms. Ruby connected with everyone she came in contact with. Her vibrant personality and zest for life endeared her to all she met. Her kindness and thoughtfulness was felt by all she knew, but especially by her neighbors and close community. While Ruby was well-loved and showed her love toward others, she wasn’t afraid to tell it like it was. If Ruby thought it, she said it. Always foxy and feisty, for Ruby it was her way or the highway. She liked things her way and there was no room for negotiation. Intelligent and eager to learn, Ruby always embraced change and was the first to try anything new. Ruby’s thirst for knowledge made her the best teacher her daughters could ever have. Always proud of her girls, Ruby worked hard to raise independent children. She was their greatest encourager, strongest support, and biggest fan. The way Ruby lived her life set an example to everyone around her. Her fierce determination and strong will made Ruby the wonderful woman she was. She believed in the motto, “Knock out the apostrophe t in ‘I Can’t’.” Ruby lived life fully, on her terms, her way…all the way to her final moments. A committal service of remembrance of Ruby’s life will be held Thursday, December 6, 2018, at 3 p.m. from the mausoleum chapel of Pinelawn Memorial Park. A celebratory reception will be held Thursday evening, beginning at 5 p.m., at HOW II, 710 West Vernon Avenue, in Kinston. Jeffrey Scott Sieben, and wife, Amy, and Thomas Alan Sieban, and wife, Krystal; great-grandchildren, Benjamin, Luke, Teddy, Beau, and Ada, as well as many nieces and nephews, and all of the children of her heart. Ms. Ruby will lie in state in Rouse Funeral Home on Wednesday from 12 noon to 5 pm and Thursday from 9 am to 1 pm. In lieu of flowers, the family requests that memorial contributions be made to the charity of your choosing. Online condolences may be expressed at www.rousefh.com. Arrangements are entrusted to Rouse Funeral Home. To send flowers or a remembrance gift to the family of Ruby Lee Alphin, please visit our Tribute Store. "Email Address" would like to share the life celebration of Ruby Lee Alphin. Click on the "link" to go to share a favorite memory or leave a condolence message for the family.